The USS Avenger was the lead ship of her class of the mine countermeasures ship (or MCM), built by Peterson Shipbuilders in Sturgeon Bay, WI. The ship was commissioned on September 12 1987 . The USS Avenger was the first ship in the history of naval warfare to locate and neutralize bottom mines and also was the longest-serving ship from the coalition forces during the Operation Shield/Storm conflict. The USS Avenger had a career of 27 years, and was eventually sold for scrap in 2014 after the Littoral Combat System (LCS) was introduced. Mine Countermeasures is a specified discipline within the U.S. that has two main methods of removing underwater mines: mine-sweeping and mine-hunting. Mine-sweeping is the process of dragging the ocean floor at any water depth, or by towing acoustic or magnetic devices that ghost as a larger ship. This ghosting tricks the mines into thinking there is a ship above, causing the mine to detonate. This in turn leaves a clear lane for shipping supplies needed for any war effort into enemy territory. The second method is mine-hunting, where the mines are sought after and then disabled/destroyed individually one at a time. The Avenger was designed to do both mine-sweeping and mine-hunting, however the preferred method out of the two was mine-hunting since the ship was more equipped for that situation with remotely operated underwater vehicle (ROV) units. On September 12, 1987, the USS Avenger was officially placed into active service as part of the U.S Atlantic fleet with her home port at Charleston, South Carolina. After the invasion of Kuwait in 1990, the Avenger was deployed to the Arabian Gulf as a member of the coalition force in the support of operation DESERT shield and DESERT storm in august of 1990. At this time, the Avenger became the longest serving ship of all the coalition forces gathered. After the end of the SHIELD/STORM conflicts, the Avenger moved home ports to a new naval station in Ingleside, Texas in 1993. After her placement in Texas, the Avenger was then deployed to the eastern Atlantic in 1993 and 1995. In 1997 and 1999, the Avenger served in the Mediterranean. After these deployments, in 2001 the Avenger was deployed to the eastern Pacific to conduct joint, combined, and bilateral exercises and operations on the West Coast. In 2001, the Avenger also participated in test operations of a revolutionary jam-resistant electronic navigation system that turned out to be very successful. In 2008, the Avenger had her most significant modernization of her sonar and diesel generator, just before her employment to the western Pacific. 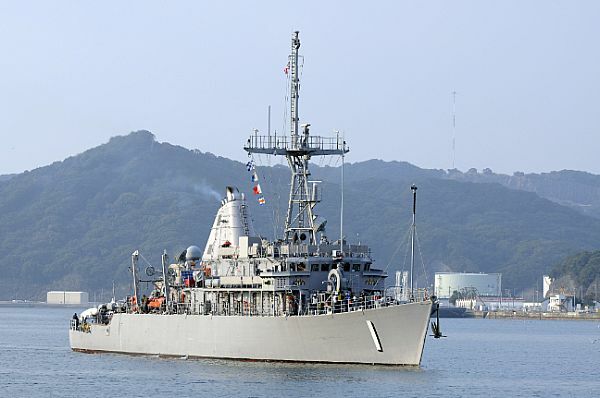 In 2010, the Avenger’s home port was relocated to Sasebo, Japan as a part of the forward deployed naval forces. In 2014, the Avenger was then sent back to San Diego, officially decommissioned on September 30, 2014, and transferred into inactive reserve . The USS Avenger had a crew of 76 enlisted and 8 naval officers, the final commanding officer of the ship was LCDR Adam Christopher Soukup . Other than the regular crew of the Avenger, the ship also sometimes hosted an explosive ordinance disposal (EOD) crew. The purpose of the EOD crew on the Avenger was to dive into the mine infested waters, identify the type of mine, and then possibly destroy/disable the explosive device. However, during the Avenger’s lifetime, the use of a EOD crew was very limited due to the risks and because the facilities that the Avenger had to offer were not fully up to the standards required by the EOD teams. There were complaints that the ship did not have enough work space/that the gas supply system on the ship was unsafe for the equipment they use . As Mentioned before, the USS Avenger was built by Peterson Shipbuilders in Sturgeon Bay ,WI. Unfortunately, in 1998 Peterson Shipbuilders shut down and sold the land to be used for residential housing. However, most of the current active service Avenger Class MCM ships were built by Marionette Marine who also developed the replacement LCS ships. Even though Peterson shipbuilders is history, the technology and design of the USS Avenger still lives on with its unique characteristics as follows. The USS Avenger’s hull was constructed of wood with an external coat of fiberglass. The purpose of this unusual hull design was for flexibility and strength against the blast of naval mines. It also gives the boat a low magnetic signature to avoid the detonation of undersea mines. The design of the avenger had two controllable-pitch propellers that were powered by four 600 horsepower Waukesha diesel engines. These engines had an aluminum block design to reduce the weight of the vessel,but this limited the number of miles that ship could travel at the maximum designed speed of 14.4 knots (16 mph). However, during the sea trials of the Avenger, it was found that the ship did not reach the maximum designed speed because the propulsion control system failed to increase the propeller pitch enough . The Avenger also had one other major issue that was not found during sea trials; the ship could not make a journey across the ocean since it would put too much stress on the aluminum block engines. This then led to the solution that the Avenger would be shipped on a heavy lift ship to its deployment with three other minesweepers . The technologies that the USS Avenger used to find and destroy mines included the use of doing mine sweeps, which is the use of dragging a wire behind the ship through the water to cut the wire that attached mines to the bottom of the ocean. The other option that the USS Avenger had was the AN/SLQ-48 remotely operated vehicle (ROV), which had a high-frequency sonar, and cameras on board that are sensitive to low light to be able to locate the mines underwater. The AN/SLQ-48 was also able to cut the mines’ mooring cables and it also had the additional ability to detonate the mines underwater with a high explosive charge. The AN/SLQ-48 has a 3,500 ft. umbilical cable that extends back to the Avenger so the ship would not get damaged where the mine exploded. The Avenger also carried a second ROV named the ATK/Raytheon ROV which had a longer tether cable of 4,950 ft . With the same ability of being able to cut mines and place explosive charges. The sensor system the Avenger was originally fitted with was the General Electric AN/SQQ-33 sonar system, however this was later replaced with the AN/SQQ-32 advanced mine-hunting and classification sonar. The ship also had a small submersible vessel that is towed by the ship that contained 2 sonar systems to detect possible mines on the floor of the ocean. The type of radar that the ship carried was the AN/SP5-55 I/J-band surface search and navigation radar. The ship was also originally equipped with the CMC Electronics LN66 or the Raytheon AN/SPS-66 navigation radars, however these were later replaced by the AN/SPS-73 system . The Avenger’s armament was quite small. The ship had four M2HB .50-cal machine guns; two M60 7.62 mm machine guns; and two Mk 19 grenade launchers. This small armament would be quite enough for this type of ship, since the Avenger was never really in direct combat with the enemy. Also, these weapons on this ship were mostly used to detonate mines that floated up to the surface after their mooring lines have been cut. The whole lifetime of the USS Avenger cost the United States about $631 million dollars. Most of the ship’s cost came from her procurement at $274 million, with the cost of personnel being a close second with a total cost of $243 million dollars over the course of the 27-year lifetime. This is relatively low compared to the $1.063 billion expected expenses for the LCS Class ships that are replacing the Avenger class for mine countermeasures . Boboltz, Jr D. A. Uss Avenger (mcm 1) Standardization, Locked Shaft, and Trailed Shaft Trials. Ft. Belvoir: Defense Technical Information Center, 1992. Internet resource. Life-cycle Costs of Selected Navy Ships: Letter to the Honorable Jeff Sessions. Washington, DC: Congressional Budget Office, 2010. Internet resource. “Offical U.S. Navy Website – Commander Naval Surface Force, U.S. Pacific Fleet.” U.S. Navy Hosting. 16 Oct. 2016. “Naval Vessel Register – AVENGER (MCM 1). “ Naval Vessel Register – AVENGER (MCM 1). 16 Oct. 2016. “Avenger Class Mine Countermeasures Vessels.” Naval Technology. 16 Oct. 2016. Annati, M., & Johansson, T. P. (2005). “MCMVs revisited: Technologies, markets and programmes.” Military Technology, 29(7), 78-88. Blumenberg, Michael A. An Analysis of Explosive Ordnance Disposal Support Facilities Aboard the Avenger (mcm-1) Class Ships. Ft. Belvoir: Defense Technical Information Center, 1991. Hepburn, . “Dual Use of Heavy Lift Ships As Maintenance Platforms and Transports for Mine Warfare Ships.” Naval Engineers Journal. 107.5 (1995): 33. Tarantola, Andrew. “The Navy’s Wooden Avengers Are Real-Life Mine Sweepers.” Gizmodo. N.p., 23 May 2012. 16 Oct. 2016. “USS Avenger (MCM 1) History.” USS Avenger (MCM 1) History. N.p., n.d. 16 Oct. 2016. “Avenger-class Mine Countermeasures Ship.” Wikipedia. Wikimedia Foundation, 28 June 2016. 16 Oct. 2016. “USS Avenger (MCM-1).” Wikipedia. Wikimedia Foundation, 28 June 2016. 16 Oct. 2016.